In the previous articles I saw how to find unused index so that you can find it and drop it to improve performance of your Insert /Update /Delete statement and claim some disk space which is really useful in production server. Today I will be exploring the script to find the missing index, after finding that index; you can decide whether to create it or not based on the requirement of your application. There are many important DMVs (Dynamic Management View) there in SQL Server 2005 and higher version which are keeping information you need to know to find missing index. Following is the list of those DMVs. “sys.dm_db_missing_index_details”: This DMV returns details about missing index you need to create. For more information on this, please click here. “sys.dm_db_missing_index_group_stats”: This DMV returns the summary of benefit you would have received if you would have the particular index. For more information on this, please click here. “sys.dm_db_missing_index_groups”: This DMV returns information about what missing index are contained in what missing index group handle. For more information on this, please click here. “sys.dm_db_missing_index_columns(Index_Handle)”: This DMV gives you an idea about what columns are missing in Index, it is based on the “Index_Handle” field of “Sys.dm_db_missing_index_details” DMV. For more information on this, please click here. So these are the DMVs which will be useful in order to find missing index, we are going to use first three of the above DMVs to find our missing index. This is just a basic advice from DMVs regarding what indexes are missing and you have to create it, finally it’s up to you based on your requirement whether to create index or not. You have to see the table name and column whether it has any selectivity or not then decide whether to create that or not as more index on table might improve performance of your SELECT but it will harm other DML statements so it is always advisable to use your human skills to decide rather than leave everything on DMVs. These DMVs could keep information for maximum of 500 indexes. 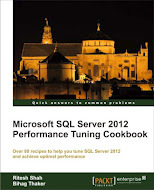 This entry was posted in sql server and tagged index, Microsoft, MS SQL Server, Ritesh Shah on June 28, 2011 by Riteshshah.